It’s commercial-speak for spreading the risk. But from my perspective, there is no risk. These guys are culinary magicians. I can honestly say this is the finest vegan food I’ve ever tasted. Period. 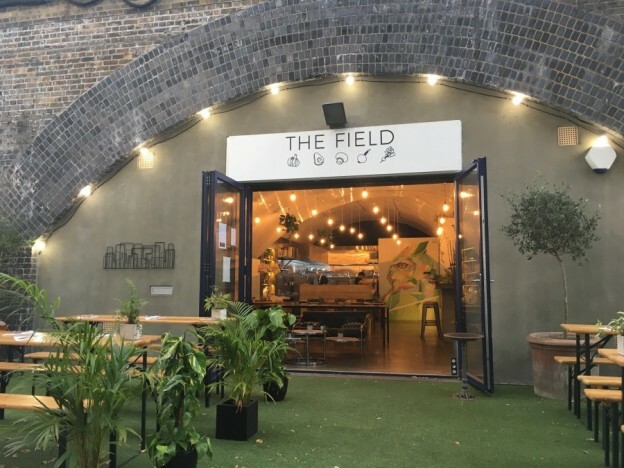 The Field restaurant is tucked away under an arch of the London Overground line, a five-minute walk from London Fields station. It may be tucked under an arch, but the courtyard terrace offers generous outdoor space on a warm summer night. 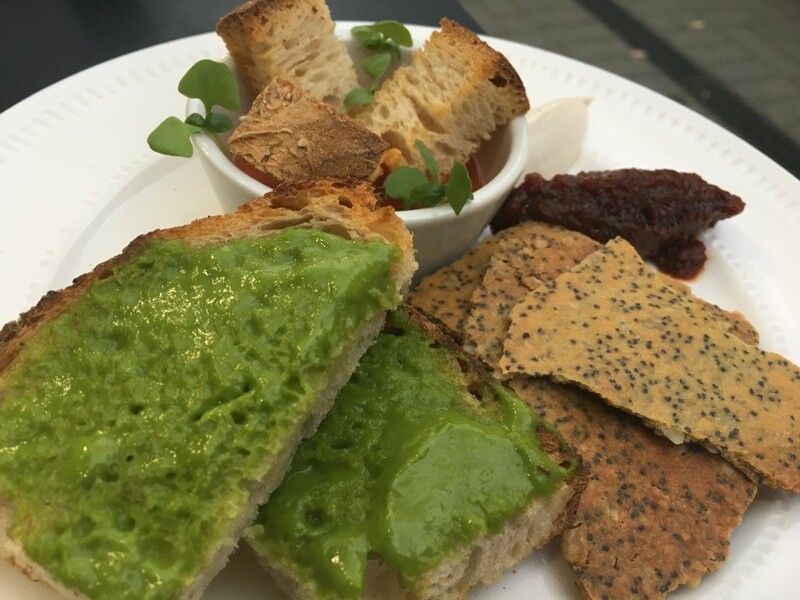 Right from the off the bar was set high with an epic amuse-bouche of tomato water with sourdough chunks, creamy cashew paste with a tomato reduction and a parsley and garlic paste spread on artisan-baked sourdough. All of it bursting with flavours. 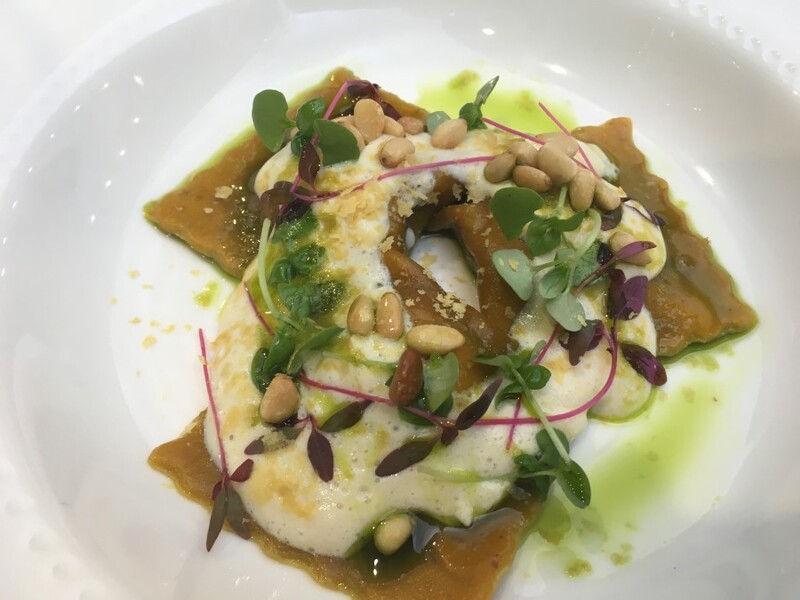 A personal delivery from Nik heralded our two starters; Pasta Agnolotti (£8) rectangles of fresh egg-free pasta, cocoa butter, pine oil and radicchio, covered in a cashew foam and topped with pine nuts. 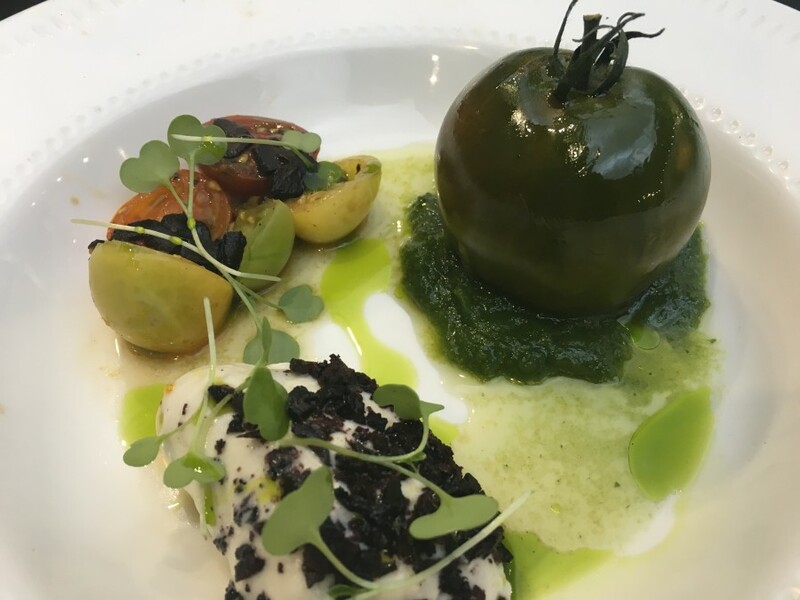 Killer Tomatoes (£6) a genius combination of a single heirloom tomato stuffed with onion and tomato relish, baby red, green and yellow tomatoes and an almost-like mozzarella paste made from cashew nuts and topped with olive ash. Sharing them was tricky as we ended up fighting over the debris. Outstanding dishes made all the better by a couple of standout glasses of wine; Barbera ‘le verrane’ a Piedmont bubbly red (£7.50) and a crisp Greek white Assyrtiko ‘Efranor’ (£7.50) courtesy of noted Sommelier Jonny Raggett. Our collective curiosity was now on full alert as we awaited our twin mains. Cabbage and Nuts (£10) may not sound a glamorous dish combination but ended up as a work of art. 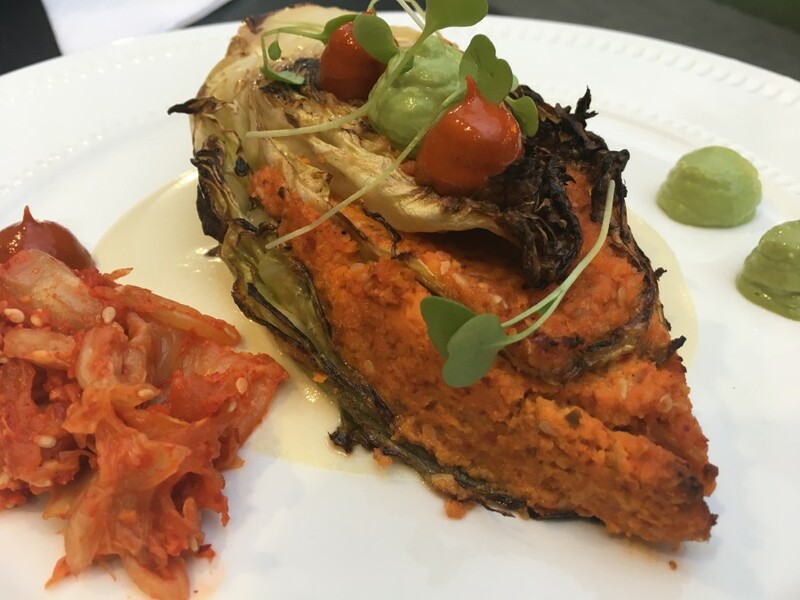 A generous slice of delicious kimchi filled with a romesco sauce made from hazelnuts resting on a shallow stream of Ajo Blanco soup. A couple of dollops of house-made harissa dip on the side an added bonus. 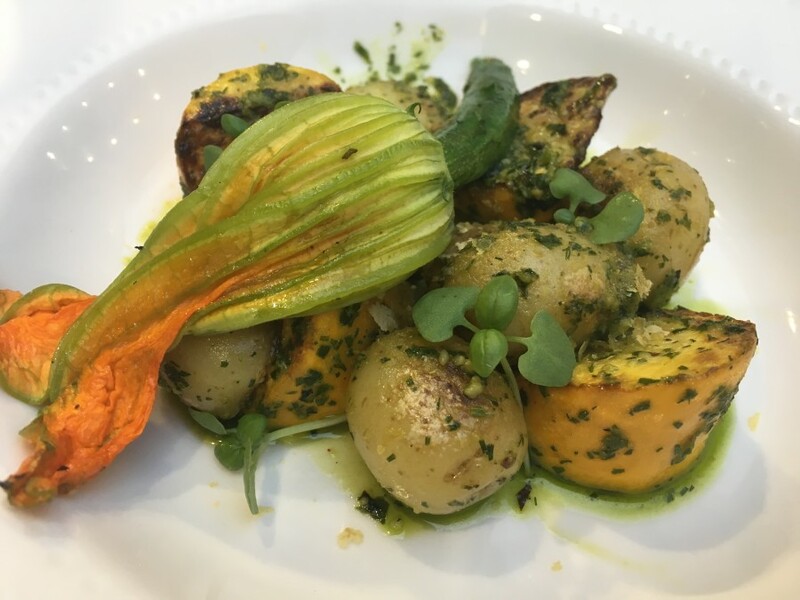 Zucchini (£8) a bed of gently roasted baby potatoes covered in a dill pesto is the canvas to which the aforementioned fried courgette flower is laid upon. So simple, yet a combination of memorable flavours, which let’s face it, is what enjoying food is all about. 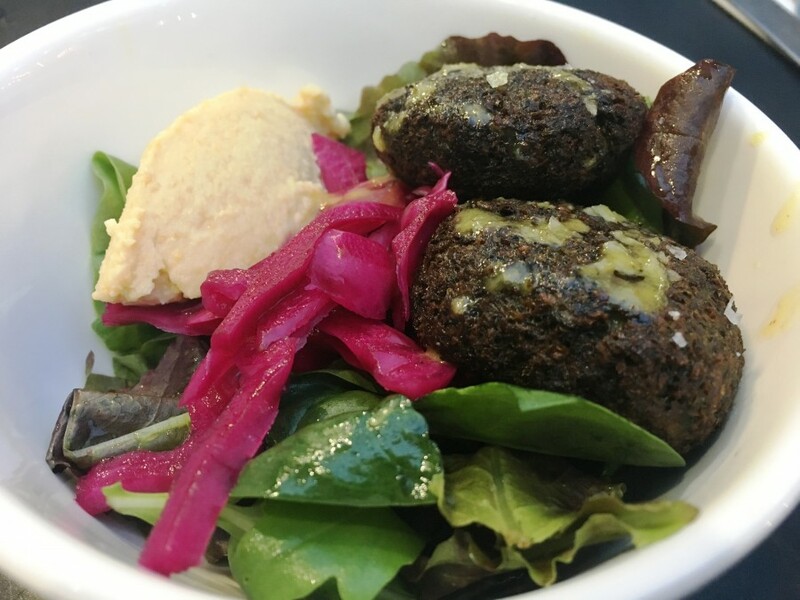 For good measure, simply because I was intrigued as to how you could re-imagine a falafel, we shared a bowl of Just Falafs (£9) tasty mint based green falafel, house-made hummus and pickled red cabbage on a bed of green salad with lemon dressing. Re-imagined successfully. Point proved. Surprisingly full now, the one dessert on offer seemed a bridge too far but the promise of tasting lion’s mane (a hairy mushroom) with a custard tart made from sweetcorn (£6) was too tempting to pass on. 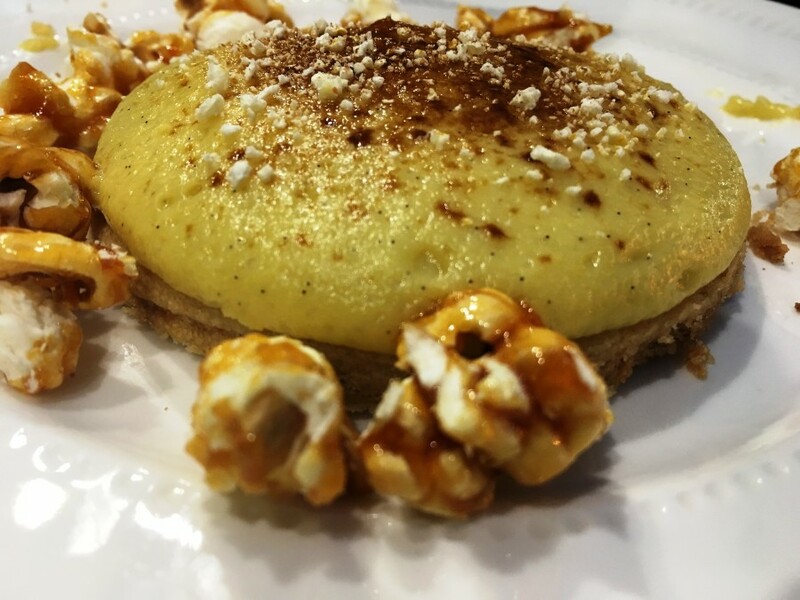 The shortbread base was satisfyingly crunchy and the custard equally tasty considering it was sweetcorn. I would have liked a little more lion’s mane dusting to understand what was special about that particular funghi. By the way, the caramel covered popcorn dotted around the plate was a welcome bonus we both embraced with vigour. 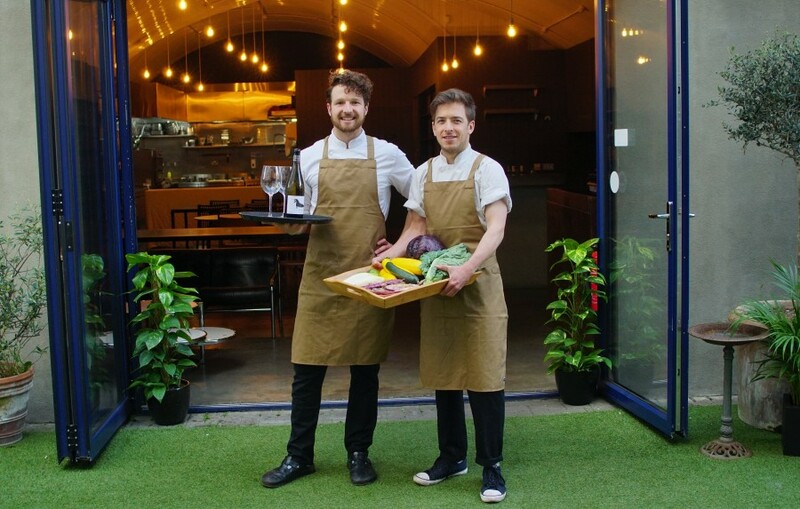 The Field is such an exciting addition to Hackney’s food scene, and what I like about these guys is they’re not afraid to try new things if an idea doesn’t work. 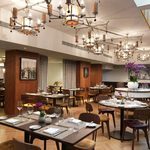 They recently ditched their tasting menu because they felt it was too restricting for their customers, they frequently change up the menu in line with the seasons and generally push boundaries. At the heart of it though is an underlying passion to prove that lovingly crafted top drawer vegan and plant-based food can be just as exciting to experience as meat and fish. And a lot healthier too. All images (except chefs by Jez Browning) (c) Andy Mossack. Open Wednesday lunchtime – Sunday afternoon. 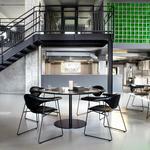 Lunch served from 11 am – 3 pm and dinner from 6 pm – 10.30pm. Brunch is served on Saturday and Sunday from 11 am – 4 pm. Sunday evenings – drinks and snacks until 7 pm. 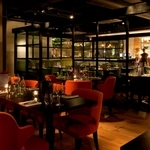 E: reservations@thefieldrestaurant.com or via the website.